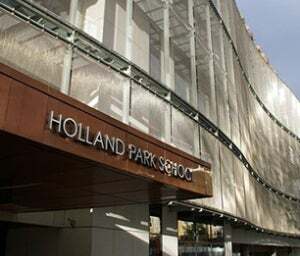 With the brief to create a building that neither looked nor felt like a school, Aedas Architects designed the high-profile Holland Park School in west London, where 1,500 pupils can be taught in a very modern and flexible teaching environment. The six-storey school building, with its unusual façade, is wrapped with an undulating skin of bronze and copper fins, which extends along its western façade and over the roof to engulf the building. To the east elevation, the fins give way to a curved brise soleil made of 2,200m² of architectural wire mesh by Haver & Boecker. The wave-like wire mesh cladding is made of EGLA-MONO architectural weave, which softens the geometry of the building and creates an effective aesthetic sun protection screen in front of the classrooms. This transparent façade allows unobstructed views from inside and reflects sunlight to protect the interior from overheating. The stainless-steel wire mesh cladding extends over the entire length of the building and seems to exist optically out of three horizontal wire mesh bands. Each band consists of several vertically tensioned wire mesh elements of widths from 1.50m to 2m and heights of 3m to 6.50m. Pre-curved wire mesh elements on the corners were used to implement the round geometry of the façade. For this grand project, Haver & Boecker supplied ready-to-install wire mesh elements using the tension profile and clevis bolt mounting system with wire connectors for intermediate mounting. A special mounting system was developed for the pre-curved corner mesh elements. Haver & Boecker also gave support in the technical preparation of the complex structure of the building. For more information please contact Haver & Boecker.